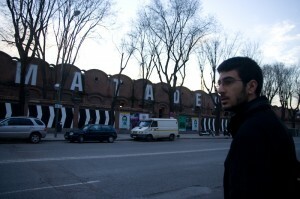 After visiting the Caixa Forum we hopped on the Metro and went to the Matadero. It’s a converted abattoir that now hosts some interesting exhibitions. We saw the five light installations by Daniel Canogar called Fuegos Fatuos (Fatuous Fire) which were quite pretty in places. There was a really interesting exhibition at the back of the Matadero which explored artificial life, communication and the ability of machines to learn. This entry was posted Tuesday, February 17th, 2009 at 10:37 pm	and is filed under Art. You can leave a response, or trackback from your own site.